All brands selling dog grooming clippers, including Andis, Oster and Wahl, also sell a wide range of dog clipper blades. There is an incredible choice that is great for experts, but it can leave you disarrayed if you aren’t that much of a clipper blades connoisseur. Which number for which length? 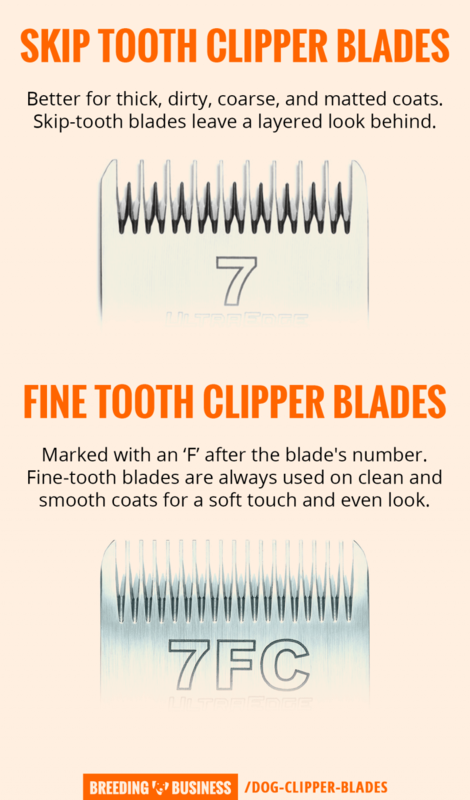 Fine tooth or skip tooth clipper blades? Strength of the blades versus smoothness of the cut? So many questions and plenty others that we are answering is this article solely dedicated to the different types of blades for dog clippers. We’ve also asked Megan Mouser, a certified groomer as well as an Andis Education Manager, for some pointers on how to sharpen and clean dog clippers blades to keep that smooth cut for as long as possible. If you own another brand, you can simply browse Amazon for some compatible blades. Sorry to break it to you but to avoid mistakes, read through this article before making the final decision! If you already own dog grooming clippers, be aware of the brand’s policy on which blades you are allowed to use. Indeed, the marketplace for dog clippers is facing huge competition between the three behemoths of the pet grooming world: Oster, Wahl and Andis. As a direct consequence, such brands have quickly adopted, for some models only, a proprietary blade system. Meaning, if you own such clippers you can only use blades manufactured by the brand itself or affiliated partners. If you don’t, you do it at your own risk and the warranty will obviously be broken. In all honesty, it’s is not that big of a deal since most of these brands have very similar pricings for their blades and they all make and sell high-quality blades. At least it forces the consumer to stay consistent with the choice of the brand. This is the spacing between two teeth and it is extremely important to understand so you make the right choice. If you pick the wrong one, you may face difficulties clipping your dog’s hair. Fine-tooth blades are marked with the letter F after the blade’s number, for example size #7F, or 3F. Fine-tooth blades are used on clean and smooth coats; they offer an even and very polished look whilst giving the dog’s hair a very soft touch. Fine-tooth blades won’t work on thick fur, dirty hair, and matted coats. Skip-tooth blades have a wider space in between two teeth in order to allow more hair to feed into the blade. Such blades are very common and tend to be used either for thicker or dirtier coats, but also for bulky trims. The end result is more layered and perhaps less visually appealing, but that finishing work can be done with a fine-tooth blade. There is no right or wrong here; it depends on your dog’s coat and what is your use case. 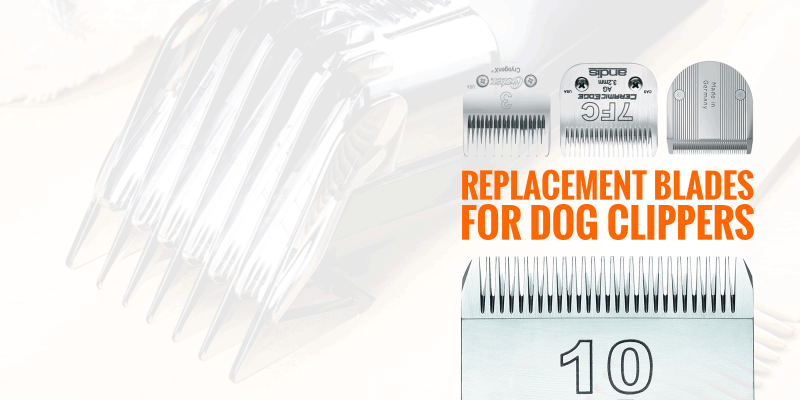 Some quiet dog clippers may have different blades that favor a cooler-for-longer cut. Dog clippers blades have what we call an edging; it is the composition and coating of the cutting part of the blade. Each type of edging offers pros and cons, and they are all good but at performing different tasks. ShowEdge Blades — the most expensive but the best for precision grooming work, leaving no tracks behinds, the go-to choice for show dogs! Most dog groomers have all of these at hand and use the most suitable for the current dog; they may even use a CeramicEdge dog clipper blade for the bulk trim, and finish off with a ShowEdge blade. Generally, ceramic blades are the best value for money for home groomers on a budget. There is no ideal material but ceramic is generally favored for its lower temperature, and titanium or silver are favored by professional dog groomers for obvious reasons. Now, if you are an occasional user, any of these will do just fine! Each brand of dog grooming clippers has its own set of blade numbers or references; but the most common ones are listed in the below table. List of different sizes for Dog Clippers Blades. Nowadays, it is common to see an adjustable blade that will be able to switch from one length to the other (e.g. Wahl Professional Animal 5in1 Fine Blade.) High-quality and premium-grade blades tend to be sold individually, so it really depends on your use case. Proper cleaning, oiling, and maintenance of clipper blades keeps your tool sanitary and ultimately prolongs the life of your clippers. To get started, every groomer needs a go-to maintenance tool kit. Mine includes the following: a bottle of Andis Clipper Oil, a soft brush, a jar of Andis Blade Care Plus, a high-pressure air cleaner, and a can of 5-in-1 Andis Cool Care Plus. Before you begin cleaning your blades, remove all debris from both outside and inside the clipper. I use the Andis Blade Cleaning Brush with soft nylon bristles to dislodge excess hair. To access those hard-to-reach areas, try Andis Dry Care High Pressure Air Cleaner. It’s equipped with a concentrator straw that can remove stubborn hair particles and product residue from tight spaces and moving parts. Andis Blade Care Plus has a Vitamin E-enriched formula that cools, deodorizes, lubricates, cleans and prevents rust. Pour a capful of Blade Care into a shallow bowl and, with the clipper running, dip the blade into the solution for 10 seconds. Be sure you don’t submerge the clipper’s hand piece, only the blade. Wipe off excess solution with a clean cloth. After cleaning, use the 5-point oiling system to lubricate your clipper blades and optimize performance. Apply 3 drops of your Andis Clipper Blade Oil across the blade’s teeth, then 1 drop at each back rail. Let the clipper run for 10 seconds to evenly distribute the oil and blot excess with a clean cloth. Then, holding the clipper with the blade pointed down, spray Andis Cool Care Plus across the teeth for a cool, clean finish. Sharpening your clipper blade is essential to avoid dull, uneven wear and maintain the quality of your cuts. High volume use requires more frequent sharpening, every 4 to 6 weeks, while blades used less often can go about 6 months between sharpening. To sharpen the blade, you’ll need to unscrew and remove it from the clipper. I set my blades on a magnetic holder, which makes it easier to sharpen without dropping the blade or cutting yourself. Before sharpening, be sure to identify which type of sharpening stone your specific blade requires. For example, the popular Andis Excel 2-Speed Clipper is equipped with a ceramic blade and must be sharpened with a diamond stone. Once you have the right stone, run the blade along it 5 to 10 times until it appears shiny and even. Don’t rinse the blade. Instead, wipe away the ground-off metal powder onto a dry towel and repeat the sharpening process on the other side of the blade. Aligning blades is often the most challenging part of the sharpening process. To ensure optimal performance, align the freshly-sharpened blade in the direction it was originally facing. Then, screw the blade in tightly. If your clipper makes a rattling sound after sharpening, turn it off and tighten the blade further. Once it is secure, apply a few drops of Andis Clipper Oil to cool down the blade and prepare for your next groom! If you don’t feel comfortable sharpening your blades at home, it’s best to leave it to the professionals. For quality control, reach out to your local Andis repair center or contact Andis Customer Service.